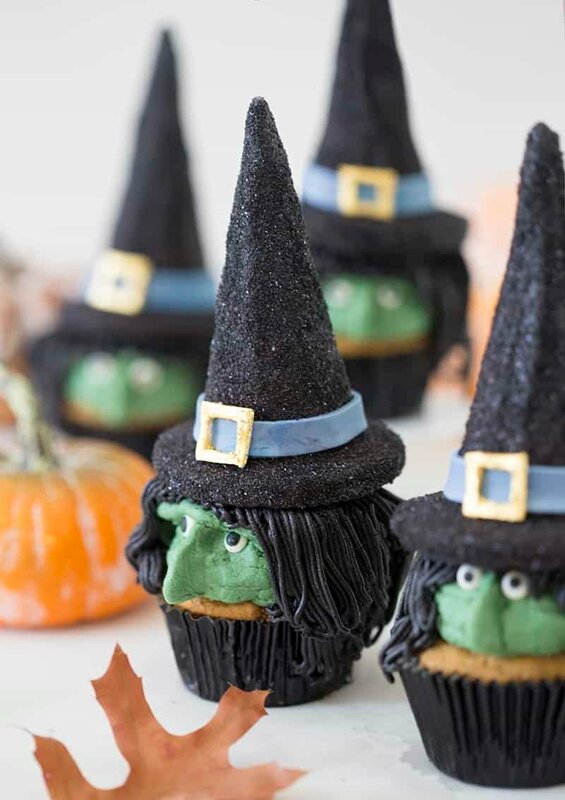 These witchy halloween cupcakes will knock your guests’ socks off but they’re delicious too! 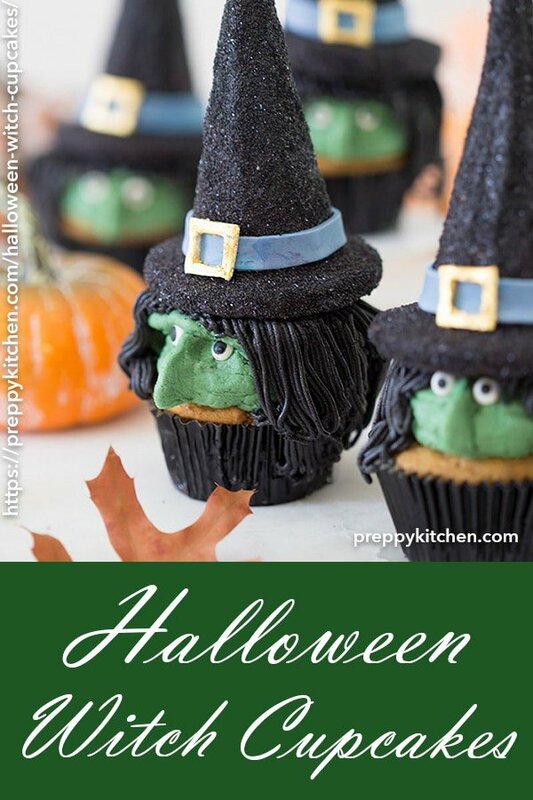 Spooky faces are piped with buttercream while the hats are made with a candy-filled ice cream cone chocolate sugar cookie for the brim and it all sits atop moist, fluffy, and richly spiced pumpkin cupcakes. 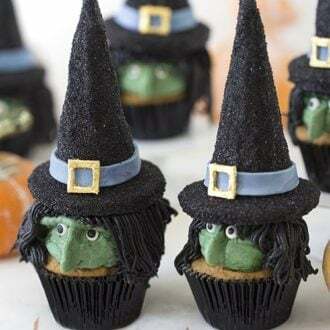 My witch cupcakes are made with buttercream faces and hair topped with a hat that might just look familiar to you if you’re a regular visitor to this blog. Last year I made witch hat cookies for halloween, which I LOVED! This year I wanted to use the same idea but take it further. I’m not going to lie, these little treats take a bit of time to make but I think it’s totally worth is and the whole project was pretty fun! If you’re short on time then skip the hats. The witch’s faces are pretty quick and easy to pipe. I used an 808 or large round tip for the head and a 125 or petal tip for the nose. Hair was piped with a large grass tip. When you’re adding food coloring to the buttercream remember that it darkens after it sits out for a but so don’t panic if the color isn’t super-saturated right away. Black sanding sugar is MESSY! So best to work over a baking pan and contain the chaos! You will be microwaving your chocolate from time to time as it cools while you’re doing the various steps. Black Candy Melt can be substituted for chocolate. It’s easer to melt and you don’t need to worry about it seizing. I used gold leaf for the buckles but they could also be made from yellow fondant. For the cupcakes; preheat the oven to 350 degrees and add the cupcake papers to a cupcake pan. Mix the buttermilk, vanilla, orange blossom and sour cream in a glass and set it aside. Now sift the dry ingredients (except the sugar) together and give it a good whisk to mix it up. Cream the butter and sugar together in a stand mixer with a paddle attachment for approximately 4 minutes on medium. Add the eggs one at a time to make sure each one is incorporated well before adding the next. Add the flour mixture in three batches alternating with the milk mixture. Make sure you start and end with the flour mixture. Be careful not to over mix, just beat until combined. Mix in the pumpkin puree and scrape down the sides of the bowl to make sure the pumpkin is well incorporated. Now pour the batter into the cupcake papers. Bake at 350 degrees for about 18-20 minutes or until the center is set and let cool. To make your buttercream, put the butter in the standing mixer with a paddle attachment and give it a little mix. Sift in your confectioners sugar in several batches, mix on low then add your vanilla. Reserve half of the buttercream to make one batch green and the other black. Put those batches in separate piping bags and create a dollop using an 808 tip to pipe the face. Use a 125 tip turned around so the face is out, to pipe the nose. Now pop the candy eyes on and use a large grass tip to pipe the hair. Once your hats are done, go ahead and place them on top, and your’e done! 1.) Preheat oven to 350 degrees. Sift together flour, cocoa and salt. Whisk to combine. 2.) Combine butter and sugar in a bowl. Mix on medium-low speed with a paddle attachment. Mix until incorporated. Don’t over-mix. 3.) Add eggs one at a time mixing until incorporated before adding the next. Don’t forget to scrape the bottom and side of the bowl. Mix in vanilla then add in flour mixture to the bowl. Mix at low speed for 30 seconds. 4.) Roll out the dough between 2 pieces of parchment paper or plastic wrap. Refrigerate for about an hour. 5.) Use a cookie cutter to cut out shapes. If you want super sharp edges then refrigerate pieces again for about 20 minutes but this is totally optional. 6.) 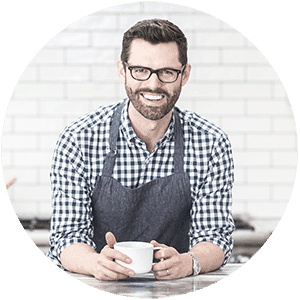 Bake on parchment or silpat lined baking sheet for 8-12 minutes or until centers are set. Let cookies cool on baking sheet for about 10 minutes then transfer to wire rack to cool completely. 7.) Roll ice cream cone in either melted chocolate or black candy melt. Use a knife or small spatula to wipe off the excess and cover any stray areas. 8.) Immediately roll in black sanding sugar. Best to pop into freezer for a couple minutes to set before moving on. 9.) 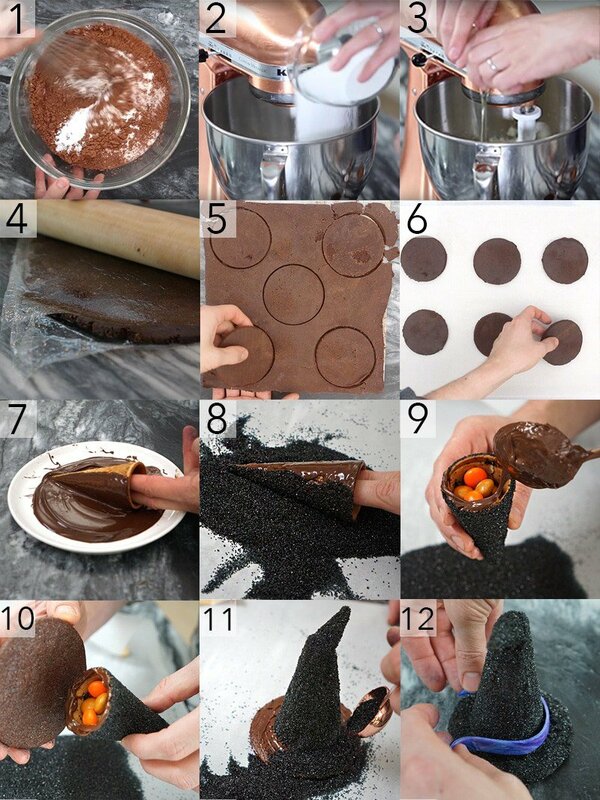 Dip the base of the cone in melted chocolate or candy melt then fill cone with candy. You could also pipe or wipe melted chocolate onto the cone instead of dipping it. 10.) Attach cookie to cone then brush melted chocolate or candy melt onto the brim. 11. )Sprinkle sanding sugar onto the brim. 12.) Add red and blue food coloring to fondant (mixing more will give an even color. Mixing less will give a tie dye look) Roll out and cut bands for the hat. Cut out a buckle shape. You can either color the fondant yellow before rolling or you can use gold leaf or gold luster powder to enhance the buckle. Attach bands to hat then add buckle. You can wipe the back of the buckle with a damp paper towel to help fasten it. 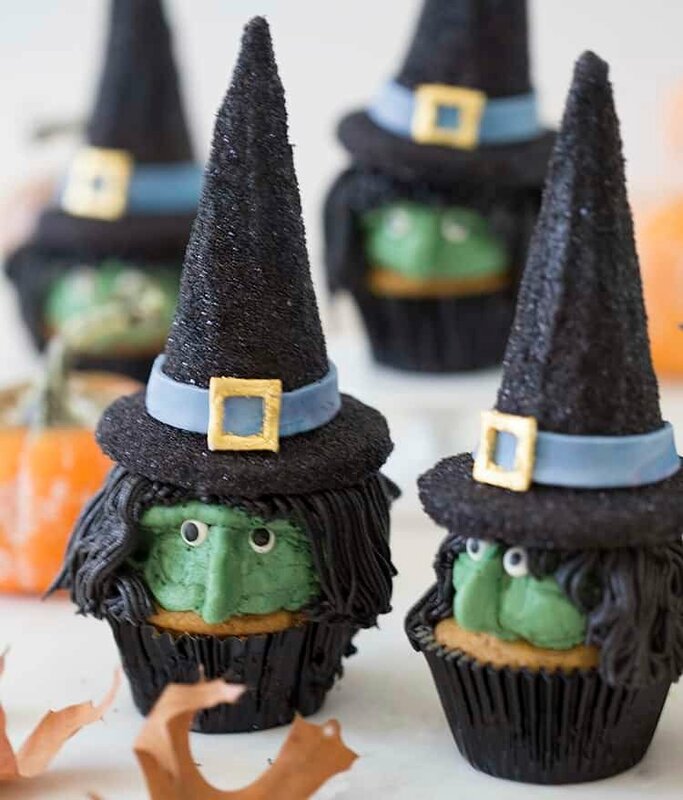 If you’ve tried these witchy cupcakes then don’t forget to rate the recipe and let me know how you got on in the comments below, I love hearing from you! 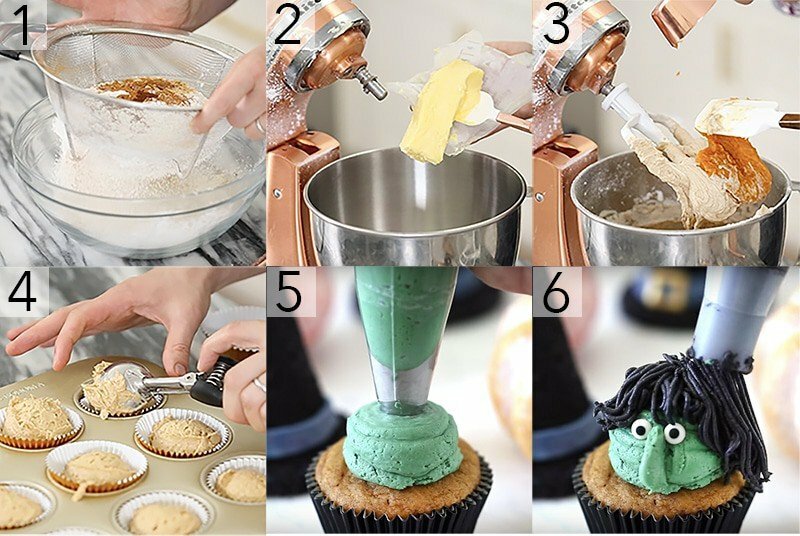 These halloween cupcakes will knock your guests' socks off but they're delicious too! The hats hide candy inside and the pumpkin cupcakes themselves are moist, fluffy, and richly spiced. Preheat oven to 350 degrees. Add cupcake papers to a cupcake tin. Sift the dry ingredients (except the brown sugar) together in a large bowl. Give a good whisk. In a stand mixer fitted with a paddle attachment, cream the butter and sugar for a few minutes on medium until creamy and combined. Add the eggs into the stand mixer one at a time making sure each incorporated before adding the next. Alternate adding the dry and wet mixtures to the mixer. Scrape down the bowl and beat until combined. Scrape down the sides of the bowl and make sure the pumpkin is well incorporated. Pour the batter into cupcakes papers. Bake at 350 degrees F for about 20 minutes, or until the centers are set. In a stand mixer fitted with a paddle attachment, add butter and sugar. Mix on medium-low speed until incorporated. Add eggs, mix and scrape the sides of the bowl. In a large bowl, sift flour, cocoa and salt. Add the flour mixture to the mixer. Mix at low speed until the dough is combined. It’s ready when it sticks to the paddle attachment. Roll out the dough between 2 pieces of parchment paper. Put on a baking sheet and refrigerate for 1 hour. Use a cookie cutter to cut out medium circles. Bake for 8-12 minutes or until centers are set. In a stand mixer fitted with a paddle attachment, cream the room temperature butter for about 5 minutes. Beat in the sifted confectioners sugar. Add the vanilla. Beat until you have an even, fluffy consistency. Dye one black and the other green. Transfer the black to a piping bag fitted with a grass tip. Transfer some of the green to bags fitted with a 125 tip and a large round tip. The assembly can be messy! Keep a pair of thin gloves nearby. Melt the candy melts in a bowl. Cover each ice cream cone in black candy melt. Over a large bowl, cover the cone in black sanding sugar and pat down. The candy melts dry quickly so work fast! Paint some candy melt on the rim of the ice cream cone. Attach it to a cookie. Paint candy melt onto the exposed part of the cookie. Add black sanding sugar and brush off any excess. Dye some fondant blue. Roll out and cut .5 inch strips for the band around the hat. Roll out some plain white fondant. Cut squares for the buckles. Paint some water onto the squares. Add gold leaf sheets and pat down to dry. Attach the band the the bottom of the cone. Add the buckle to the middle. Pipe a large dollop of green buttercream for witch head. With a 125 tip, pipe a long witch nose. Add candy eyes. Add bangs and hair to the witch head. Attach the hats. If you're short on time then skip the hats. The witch's faces are pretty quick and easy to pipe. When you're adding food coloring to the buttercream remember that it darkens after it sits out for a but so don't panic if the color isn't super-saturated right away. If you can't find candy melt use chocolate! Just be careful not to burn it and remember that it takes longer to set. Thanks!! I’m happy you like them! Let me know how they turn out! So fun to make and delicious! Thanks!